There are times within theatre that can be crafted with pure admiration. Whether it be simplistic or complex, the rawness, the genuine rawness of theatre lingers within even the smallest detail. Once it is seen or felt it cannot be undone. After all that is the job of theatre. To convey stories in ways that sometimes cannot simply be said. They must be felt. This is what I feel Stories on Stage is accomplishing within their current works that are being performed throughout the Denver Metro/Boulder area. When seeing a reading of Dear Elizabeth on a cold Saturday Night at Nomad Playhouse, I believe their mission statement has been met with great success. Now before going on there is a very sad truth to some works in theatre. They do not always make it to the stage. Some great works whether it be in the form of literature, a play or really just a topic of discussion that have not been seen or given the chance to truly shine. They need to be given a voice in a time where others would not allow it. That is what is being done here. Stories on Stage is giving that voice to these works. And in this case, it truly works with the play Dear Elizabeth. The play is based on the letters between two poets, Elizabeth Bishop and Robert Lowell and their complicated thirty year friendship. The story in itself is so ...interesting. The letters written between both them are intriguing to say the least. And Playwright Sarah Ruhl contributes such raw emotion that allows the audience to feel as if these letters were written not so long ago. Capturing the humanity of each poet with such empathy and compassion that one cannot help but grow fascinated by their words. What also is wonderful is the two incredible actors Emily Paton Davies and Sam Gregory that never seem to stop. Their work is wonderful, their dedication to the craft is astounding. Even with something as simple as a dramatic reading of this play, there is a rawness of emotion that cannot be taught. Watching as they read the letters of Elizabeth and Robert is a strange mix of both hilarity and tragedy. But...isn't that what life is about? It is never one or the other. That is what I feel is so important about what Stories for Stage is doing. They are giving people of the Denver/Boulder area a time to hear works of literature or plays in a way that, while some can think is boring, to others means so much more. The history of Stories on Stage goes further than just the current productions or the people that it brings in. These unique little productions or reads all began in 2000 with a pilot performance at the Acoma Center in Denver. What came next was the beginning of a foundation that create special shows at the request of citizens on topics of interest to our community. Whether it be something from the literary standpoint such Dear Elizabeth, or the topics that some just wish to explore, such as mental health, history of our nation, or even stories of different cultures. Stories on Stage is providing something that simply cannot be found nor is it something I have really come across in my time spent here in Colorado. I was fortunate enough to see this wonderful dramatic reading of Dear Elizabeth, which was met with great applause by the audience and the joy of both Davies and Gregory along with myself. After seeing regional production in the area for over three years, I find Stories on Stage have a strong voice within the community, one that is giving individual voices not only to the works of literature that aren’t always put on the stage in the area, but are requests from the people. They are given a large choice in what they wish to see performed or read on stage which I think is a fabulous and an ambition way to present works and topics into a community. Truly I will praise Davies and Gregory for days on end, their talent is tremendous and even watching them read from a script is a wonderful night of theatre. But the biggest statement that was made that on October 13th is this corporations dedication not only to the people of the Denver/Boulder area but to the community of theatre that is growing stronger each day within the Rocky Mountains. These are stories you are not want to miss. Believe it or not historical events are slowly finding their way back into theatre. The idea of seeing it performed on stage can be a bit daunting but thrilling, just as it must have been for the people that took place in the very events that are being told. But then comes the interesting question when the opportunity arises. What story can be or should be told? 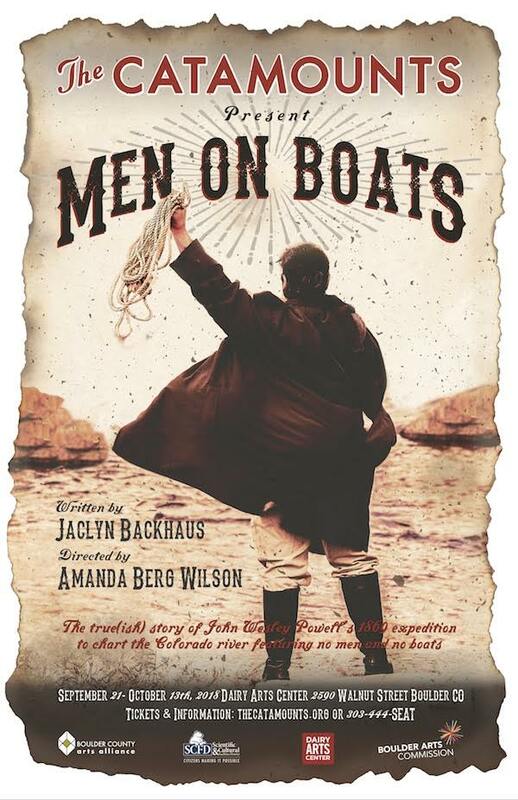 Obviously there are many, however one playwright Jaclyn Backhaus found the need to tell the story of John Wesley Powell's 1869 expedition to chart the Colorado River. But with a defining twist that sets her play apart from many. That being there are no men. The entire cast of historical figures that took part in the very expedition are played by women. It isn't just this trait that separates, The Catamount's production of Backhaus's Men On Boats apart. No, what sets it truly apart from many shows that are opening this fall season here in the Denver Metro Area, is that there is a clear sense of fearlessness that is truly encases the irresistibly we as human being find whenever it comes to the unknown adventure that awaits us. The production directed and co-choreographed by Amanda Berg Wilson, banked on the shore of the Carsen Theatre at The Dairy Arts Center, Saturday night to an anticipating crowd. With a star studded cast, filled with both well known, and new talent, the audience members at this performance could not stop laughing, nor could they look away as this group of explores charted down the Colorado River right before their eyes. Leading the group was GerRee Hinshaw who takes on the role of General John. W Powell himself. Her charismatic and demanding performance is a sight to behold, with such raw emotion and strength one couldn't help but find the need to follow Hinshaw's lead into the great canyon and down the rapids to the very end. Satisfying to say though all the performances in this group of talented women are so pleasing to watch. Their dedication to the piece shines through, with not only boundless artistry but with just a sense of pure fun. This is after all what some explorers did this very trip for. Fun, they wanted to see what this part of the country was and what it could be while making a name for themselves. And this group does it and more. Every bit of character is drawn out by each actress. Giving their male characters such...depth and unique personalities with great humor. So many performances stood out that during the entire run of the show I didn't know which way to look because each actress was just giving it their all. And that can be hard to do, especially when it comes to a more historical play rather than something simply made up by a writer. These were actual men that made this journey, and experienced all that came their way. Each actress portrays it again with a great sense of humor, realism and wit that only the likes of this company, Karen Slack, Joan Bruemmer-Holden, Edith Weiss, Erika Haase, Ilasiea Gray, Joelle Montoya, Jessica Austgen, McPherson Horle, and Missy Moore could give to the lucky audiences that will see this play through it's run. But it isn't only in the acting that this production finds it's charm. The production team, with set designs by M.Curtis Grittner, Lighting design by Kristof Janovic, and Sound design by Brian Freeland, go hand in hand, creating the Colorado river, it's cliff in all its majesty before your eyes without needing much to send imaginations soaring with wonder. Their designs also bring life to rough territory that hides behind the beauty and death that could be at every corner for the expedition of explorers that seemed to find struggles the further down they travel. This play of course can be seen as a comedy, but with the direction that Berg Wilson has taken with it, I don't think one could classify it as such. It's so much more. It's a true balanced piece of theatre with both seriousness and comedy so neatly tied to one another you can not see the distinction between the two. Which creates a perfect afternoon of storytelling. Though this is the first production with The Catamounts I have experienced I can assure you it will not be the last. The fearlessness that is produced in this show is far too hard to ignore, and creates a story that could have easily been a boring historical play. Instead it turned into a night of hilarious, genuine and real performances accompanying a story with simple but strong bones that could withstand the very best of theatre. Put simply, this is a journey down the river you need to be on. Disney musicals have established a genre all their own within the realm of musical theatre. Each one encapsulating their respected films and characters. Out of the realm of Broadway however Disney musicals can sometimes be very hard to bring to life on the smaller stages. With this being said, something magical is flying in with the change of the wind at Candlelight Dinner Playhouse with their production of Mary Poppins. This production’s charm captures you the moment you walk in and take a seat for dinner. The cast ever so sweetly serving you dinner and chatting you up just before they take the stage. Which as I have said with my previous experience at Candlelight; The performers go above and beyond for the experience of the audience and that is before the overture can even begin. Once it does, the charm never leaves. The cast is so in tune with the performances and characters that you find yourself transported back to being a child; watching the famous film that so many people have come to love. While there are changes obviously made to the stage production that doesn’t take away from anything. If anything these changes add so much more. But the practically perfect pieces to the puzzle of this production has to be Harmony Livingston as Mary Poppins, and Cole Emarine as Bert. With such big shoes to fill from the ones that came before, the two are so comfortable and so easily enjoyable that you forget the real Mary Poppins and Bert are not who you are seeing on stage. Their chemistry is delightful and their voices are so pleasing to hear when hearing Chim Chim Cher-Ee playing over the orchestra. Another wonderful performance that must be mentioned is Alisha Hayes as Winifred Banks. Her performance in this role is wondrous and quite a joy to behold. Her voice is beautiful, and her chemistry with the entire cast is just wonderful to watch unfold before our eyes. Director Pat Payne and his company have strung together pure magic with their commitment and attention to detail. The scenic design by Casey Kearns adds a simplistic warmth to Cherry Tree Lane, leading itself to the familiar oil painting that we see in the film. Allowing their guests to slip out of the harshness of the world even it is for just a short while. If the costumes, actors, or scenic design does not give you this feeling or escape, then the magic surely will. I do not believe there is anywhere else in the Denver Metro Area where you can actually see Mary Poppins fly on her umbrella, or an upside-down dancing chimney sweep. Candlelight surely out did themselves when it came to the over technique and precision of these moments, but it is also the smallest of ones that leaves you feeling like you are on this journey with Jane, Michael, and the Banks while this nanny turns their worlds upside down. Overall this was a wonderful experience. Candlelight’s commitment and love for theatre shows rather well along side Marry Poppins and crew. Even if Disney musicals aren’t truly shows you want to see, this is one production I would say, you really should. When you walk into a theatre what do you normally expect? A wonderful night experiencing a meaningful story filled with heart and dazzlingly performances right? Well, what if those talented people that provide these performances also served you dinner just before they come on stage to perform, dance and sing their heart outs? It would be a completely different experience than one would think with traditional theatre. This is exactly what night I had when attending a production of Newsies the musical at Candlelight Dinner Playhouse last Thursday evening. Directed by Pat Payne, this production of a once long forgotten Disney film now turned musical sensation contains a very genuine heart and love for the original production. Entering the theatre there is a certain amount of charm to the nice set against the many tables of Candlelight Dinner Playhouse. One that can only be given with the backdrop that is New York City. The story follows a group of Newsies that work on the Manhattan streets day in and day out seeing newspapers. However when their boss Mr. Pulitzer played by Kent Sugg, raises the price for the papers they sell, Jack Kelly (Logan Traver) the leader of the group decides that its time to take a stand. Accompanied by his fellow Newsies and a strong headed writer named Katherine, they do their best in order to make their statement and get the prices reduced back to what they feel they rightfully deserve. The show is known greatly for it’s music, written of course by Alan Menken (The Composer of some of Disney’s greatest and well known songs) and even more so for its choreography. This production being choreographed by Matthew D. Peters, who did very well when adapting it to this production, however there were times that the dancing could appear to be a bit thrown off. Newsies is a musical that depends heavily on it's dancing and tap scene. And while the tap scene was phenomenal in itself and is one of the best parts of the show; other moments did appear to flop, slowing the show down ever so slightly. With this being said, it still did not take away from the heart of the show. The entire cast did well, and held a sense of strength and roughness around their edges as if they were New York boys working no the rough streets of the times. One I have to eagerly point out was Ben Welch as Crutchie. His performances has so much emotion that you can’t help but root for him every time he is on stage. He also becomes the perfect balance for Logan Traver’s Jack Kelly and both have such a good chemistry as well as all of the Newsies within the show. Now with every experience at Candlelight comes the ever so unique matter of what differs it from any other theatre. The dinner experience that takes place prior, during and after the show is something that is definitely exclusive to two theatre in the Denver Metro area, Candelight being one of them. The dinner of course is served prior with the entire cast as your waiter, and waitresses. While this was very much so a wonderful experience I still find it a bit strange to see the cast serve you desert during intermission. Though it adds a lot to see them in full costume before heading back on for the second act; leaving me to wonder how they are able to do all of this as well as put on a show. I have to praise the entire cast for this, not only did they somehow manage to pull all of this off, but they also were standing by the door to thank us for coming as we left the theatre. That is a class act, and very respectful. In many regards I felt like I should be thanking them for working and performing as well as they did. Newsies isn’t an easy show to do, and while I did see a few missteps from time to time that did throw the show off in its entirety, it still was a solid night of theatre, with a great heart at its center by it's amazing cast. One can say they definitely seized the day. When we think of a spy who is the first person that comes to mind? Obviously it is gong to be that of James Bond, or some character along those lines. We can envision the smooth, devilishly charming Brit going against all odds and dangers, escaping death at every turn. Through this spy game so to speak we as the viewer find ourselves desiring that type of lifestyle. That thrill and impending danger that keeps us guessing what will be coming around the corner. Making life all the more adventurous when comparing it to the dull routine of the everyday man. But what happens when that everyday man is pulled straight into one of these spy games? Hilarity. Straight up hilarity. As I took my seat at Miners Alley Playhouse for their production of Alfred Hitchcock’s, The 39 Steps, I had no idea what a fun night I was in for. Entering the theatre you are welcomed to a simple set, a touch of 1930s music playing in your ear before seeing an old projector illuminating the original poster from the Hitchcock film, who wouldn't be excited? The play opens on our main character Richard Hannay (Casey Andree) as he speaks on how he himself wishes for a bit more excitement in his life. As fate would have it, he gets that rush of excitement when running into one Annabella Schmidt ( Alaina Beth Reel) who claims to be a spy in need of a place to go. What follows suit leads our main character on an adventure of a life time, as he avoids enemy spies with only one question on his mind, accompanied by an agonizing tune that just won't seem to get out of his head. Director Josh Hartwell, clearly has admiration for this piece and went to great length to ensure that his actors and the audience members enjoy themselves while going on this wild ride. Within the small stage setting that is Miner's Alley you can't help but feel right in the middle of the action. Hartwell and his crew take full advantage of the space leaving room for the utmost creativity when staging the show. The four actors are constantly on the move, two of them (John Wittbrodt and Sean Michael Cummings) take on more roles than I could count. From switching accents at the drop of a hat to going through lightning fast costume changes, they defiantly make your head spin in all the right ways as they themselves stole the audiences heart no matter who they were at any given time. Honestly there wasn't a moment where I wasn't smiling during the show. The quick wit and clever cast takes you back in time enjoying a classic that many I feel need to be reminded of. Through the hilarity, creative use of props, and wonderful talent, The 39 Steps is something that can't be missed. While we ourselves will continue to dream on what it would be like to be a spy, Richard Hannay can certainly give us an idea of what would happen should the opportunity come knocking; taking us on one of the funniest spy games in history. Leaving little traces, and clues to one of the biggest mysteries that alludes us all. What are The 39 Steps? It would seem no one can ever escape the lure of a good mystery, of a mindful game of cat and mouse, but how long can this game go on before one becomes… exhausted? The answer lies within the Vintage Theatre’s production of Sleuth that opened on Friday evening, to a thrilled audience. Directed by Bernie Cardell, this play follows mystery novelist Andrew Wyke, who invites his wife’s lover over to his home, for a chat. Quickly the meeting turns into a game where the audience finds themselves caught in an interesting mystery ridden battle of wits. The first act of the show is phenomenal, leaving you guessing at every turn, and wondering how this all will turn out in the end. I found myself on the edge of my seat upon watching the two leading men, Mark Rubald (Andrew) And Brandon Palmer (Milo) interact trying to outplay the other. Both men are devilishly wonderful in their roles, all the while being extremely charming. While I found myself completely enthralled within the first act of the daring game of who is really who, and what the underlying motive was, I found myself being guided into a slight state of confusion upon sitting through the second act. Listed in the playbill are five lead actors, and while I found it interesting to see an all male cast, I was struck when three of the five did not appear on stage. This comes across as a confusing choice, as I at first did not understand why this was done. Perhaps it was done to put the wool over the audiences eyes and take them into a slow realization. However the less I saw of the actors the more I found myself looking into the playbill, instead of the show, trying to piece together when they would actually appear; only to find them nonexistent. The choice was defiantly a risk, however sadly it does not pay off, leaving its audience in a slight confusion throughout the second act. While Cardell direct’s the show well, and his actors pull out all the stops on their performances, the fall comes within the writing. The show I feel could have been a bit shorter, allowing the audience to take in the state of shock that they are given at the end of the first act. The second feels more like the game will never end, repeating and repeating the same misguided less suspenseful game that we have already seen played not once, twice, but four times when the show final ends. Leaving you a bit tired, headache ridden, and distasteful at the thought of someone messing with another person for so long. Granted given the time the play was written. I can see why so many people adored it, and why it earned the Tony for best play in 1970. With that being said, if risks were to be taken, I believe it should have been taken on a more plot driven decision, instead of the playbill. There is no doubt that this production is a mystery driven game of chess, that will leave you shocked and delighted to have seen a whimsical sadistic game being played before your eyes. It just doesn’t know when to allow itself to declare the winner. This time of year brings many things, joy, laughter and tradition to name a few. People will also expect to be enchanted by the classic tale of Charles Dickens own, A Christmas Coral; as they do every year around Christmas time. This famous novel has become a tradition in many family households. Whether it be through the book, film or stage. I have failed to meet one person who does not watch or read this classic story.My opportunity to enjoy this tale came on Dec. 8th when I attended The Miner’s Alley Playhouse’s production in Golden. Written by Josh Hartwell, this unique take on Charles Dickens most famous work, is told through the eyes of a family on Christmas Eve. With there only being six members of the family it is up to them to take on the form of the various characters that we have come to know and love within the familiar Christmas story. This comes across as a very simple idea but it also presents a challenge for the actors involved. It isn’t a traditional tale of the story, while Scrooge is visited by the Ghosts of Christmas Past, Present and Future, the family themselves reminds us of what can be often special about the holidays. How it brings us all together and allows us to fulfill the fun yet weird traditions we love. Hartwell’s story captured that true spirit of Christmas all the while creating a sense of family within the confides of a small living room set. This again shined against the familiarity of the play. The actors did not need lavish sets or a complete scene change to tell the story. It is as simple as that. A small family acting out the novel, not for anyone in particular but all for the joy of storytelling. Having already seen another play written by Hartwell, he has established himself as a true favorite in my mind. The as well were just as charming and deserve just as much praise for their hard work and dedication especially one Jim Hunt, taking on the iconic role of Scrooge. I hope this unique take continues in the Holidays to come. The holiday season is officially upon us, which means many shows throughout Denver will be festive with that magic touch of holiday cheer. This is what I expected upon entering the The Edge Theatre on Friday for the opening night of their new play, Resolutions. Written by local playwright Josh Hartwell, this new play defiantly defies the definition of a Holiday show. While it is not yet Christmas, the show takes place directly after, on New Year’s Eve. Hartwell’s focus falls on a small group of friends that are about to throw their annual New Year’s Eve party in a cabin situated in Vail. We are introduced to Dellen, the owner of the cabin, played by Emily Paton Davies and her gay best friend Gregory played by Scott Mclean. Both are getting settled in the cabin, sipping on some cocktails as they wait for friends Peter, (Andrew Unhlenhopp) and Mindy, (Karen Slack) to arrive. The characters carry a certain humor that only true thespians could as they recount on some pivotal moments in their acting careers, fallen marriages, current marriages and personal issues. All the while preparing to open an envelope that holds their previous New Year Resolutions. What ensues is something that takes this comedy in a direction that I find Hartwell shadowed perfectly. The actors in this show are enduring, as they loose themselves in their characters personalities and struggles. We become immediately invested with their stories and are shocked to find what secrets hide behind their snarky attitudes as the set designed by Brandon Case is very intimate with the audience allowing you to be up close and person with the actors. What Hartwell’s script does so well, is that it invests you so quickly in what the characters are saying. The audience learns so much about them within such a short amount time that you yourself loose any conciseness of time. This is very important considering the show runs straight through without any intermission. With so many holiday shows going on, it is nice to see a play that is so fresh, new and different in many aspects. Such as revealing what power honesty holds and what it can reveal even in the mist of a holiday so focused on new beginnings. You will go into this show believing you know what you are in for and come out surprised; thankful that your guess was wrong. Hartwell and Director Missy More have produced a show that fabricates its own unique flair. Separating it from the pack of traditional holiday shows that have enchanted the Denver Metro Area. 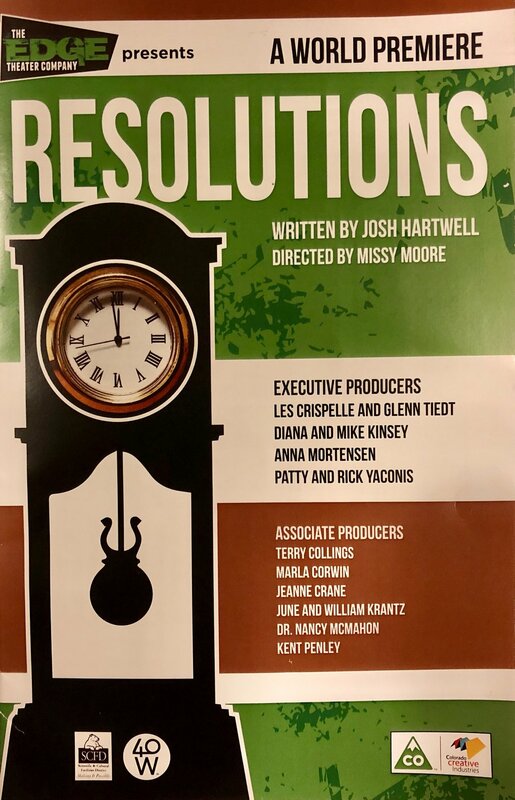 Resolutions runs at the Edge Theatre from December 1st through the 31st. For tickets go to http://www.theedgetheater.com/content/past_seasons/resolutions.asp or call 303.232-0363 for more information. When a new show begins its journey on Broadway there will always be people within theatre circles that tend to bet on how long the show will last. Either it being successful, or for it to be forgotten as another flop. I can imagine that some opinions were mainly negative when word began to spread of what was making it’s way soon to Broadway in late 2003. Yet I don’t believe anyone could have anticipated what Wicked would bring when it opened in New York. It was a show according to some that was filled with issues, and needed a lot of work. The show is based off of the novel of the same name written by Gregory Maguire; a book that was considered a darker spin on the characters of the Wizard of Oz; with its main character being the Wicked Witch of the West herself. However what people did not expect is the impact it would soon have not only on the theatre community as a whole but also the world. To start off, Wicked was one of the first shows to have two female leads. Shocking isn’t it? Surely there was one show within Broadway’s long history that had to have two females as the leads correct? Yes, there was one show and that was Mamma Mia. However when looking at the context of the show Wicked took a more serious turn than the Abba musical whose plot surrounded three men and an array of characters. Wicked simply focused on it’s two leads and the experiences that changed them; they just so happened to be women. This was it’s first step with making a small dent in Broadway history. What I feel is the most impactful element of the show is the representation of Elphaba and Glinda. People still leave the theatre moved, some audiences members crying before the end of the first act. But why? What about this story of the green skinned Elphaba, soon to be called the Wicked Witch and the bubbly Galinda that would become known as Glinda the Good create such emotion? Each woman represents something we all can relate to and have to handle throughout life, Elphaba being the representation of strength. During this day and age people are bullied, alienated because of their differences. Who would not relate to someone who is ridiculed everyday of their life due to their differences or in this case greenness. People of all ages, race, or gender could relate to being picked on or stared at because they look funny, or appear different from what society believes to be normal. It isn’t only Elphaba’s struggles that make her likable though, it is her personality as well; her inner strength to stand up for what she believes in and not to back down because it would lead to her down a different path. Today finding the strength within yourself can be a very tough obstacle in life that many people never truly face. Fear, desperation, loneliness, it can all push us into a quiet area hoping to avoid conflict. Yet Elphaba’s strength pushes her to break those limits. Letting others see that the strength within themselves can be reached. We just have to let it defy the odds. Even with her strength Elphaba is still human and just like every character in the show, she finds herself affected by the people around her. She is mainly changed by Glinda. While being a bit …well blonde, Glinda is a character that appeals to audiences due to her dramatic personality and the change she undergoes throughout the show. This brings about what Glinda represents, something people have to look a bit closer to see. The show accepts that change will happen in this world, wether it be good or bad. At first glance her character is a bit bubbly and ditzy, being obsessive with her outer appearance. Yet as the show continues Glinda begins to look past what she sees in the mirror. After her journey Glinda does not break, she stands tall, strong and ready to face what Oz has waiting for her, This is what makes Glinda so relatable. A person growing up, changing over time and coming into the person She didn’t even know existed. Not many shows have this much character development within their leads as Wicked has within Elphaba and Glinda. This brings out the message the show conveys. Be who you are, stand and speak up for yourself. Don’t let others control your life, your goals or your dreams, but allow change to come into your life. You never know what it might give. It is with this that Wicked has impacted the world. The show is going on it’s 14th anniversary on Broadway while having opened companies in London, Germany, The Netherlands, Finland, Japan, Mexico, the list continues to grow every year and I don’t believe it will be stopping anytime soon. With its message this show has brought more people together within this world. Allowing people to have a better understanding of themselves. I remember the first time I saw this show. I was 17 going into my senior year of high school. Once I stepped into that theatre, seeing the set for the first time, I felt this comfort surround me. This form of acceptance, of safety and artistic wonder. Not only did this show give me this, it also gave me a community of friends that have changed me in ways I still have cannot believe. It is why I will always be in the mood to buy a ticket to see this show, it is why it will always remain my favorite. It changes you, it changes people around you. It gives so much without realizing it. Knowing that other people might feel the same as well is amazing in itself. A show, and its characters can bring out so much within a person, helping them in ways the production team did not realize they could. Breaking the barriers between an audience member and the actor within the show creates a bond knowing that everyone has endured some similar experience in life. It allows both the audience and the actors to open themselves up to the show and characters in ways Broadway might not have done before. With Stephen Schwartz’s amazing score, Winnie Holzman’s moving plot, and Joe Mantello’s insightful direction, the show has created a being of its own. One that is very human, touching anyone that will listen to what it has to say. Wicked’s importance is for women, men, young, old, it is for everyone, giving Broadway a new piece of history to add to its books and giving us the true understanding of the importance of what it means to be Wicked. Wicked currently continues to play on Broadway at the Gershwin Theatre in New York City and is enchanting people across the country while on tour. Wicked is produced by Marc Platt, Music composed by Stephen Schwartz, Book by Winnie Holzman and Directed by Joe Mantello, based on the novel by Gregory Maguire. 2013 was a strange year for me, Things changed so dramatically. I was more willing to take on risks. I was getting a bit bored within my normal routine. So when an opportunity presented itself, or more so was brought up during a conversation with my good friend in New Jersey I couldn’t say no. A trip into New York City was a need, something I rarely am able to do. With this trip came a show that took me by the shoulders and shook up some expectations and views I had for the theatre world, and what exactly a show could do. The show was one I myself had never heard of, The Mystery of Edwin Drood. It was a revival that opened in 2012 played at the famous Studio 54 and I couldn’t resist it’s wonderful casting; with the likes of Will Chase, Jessie Mueller, Chita Rivera, Andy Karl and Stephanie J. Block. I was awe struck. What I didn’t realize was just how interactive this show was; being based on Charles Dickinson’s unfinished novel of the same name. So the question presented itself upon my friend’s and my arrival. How was it going to end if the original material was never finished? First off The Mystery of Edwin Drood is a murder mystery; providing itself with arrangement of strange and unique characters that make their way through the audience, greeting their patrons upon their arrival. I had never seen this done within a show, especially a musical. The reactions of the audience was very well received and I too enjoyed watching the actors as they speak in character to different audience members. Once the music strikes up though the actors go straight in to start the show. Each one clapping and singing showing off their many talents. The show is nothing short of hilarious with the premise that it takes. While following its source material what The Mystery of Edwin Drood did so well was that it's setting is in an old theatre. Following a group of actors that are playing the roles of the characters from its source material. A story within a story you could say. So each actor is not playing one role, but two. Which is actually very amusing to watch, especially Stephanie J. Block playing both stuck up guest actress Alice Nutting, as well as the gender bent character of Edwin Drood. Block’s credits speak for themselves and here she gave a performance that was well worth the tony nomination she had received that year for the role. Honestly I could go on and on about this show. The plot is intriguing, the characters themselves are charming and really give you a wonderful experience. Director Scott Ellis brought together something that had never ben revived and made an experience I don’t think many audience members will ever forget. The idea of eliminating that separation between the audience and the performers is something that made this show stand out. It gave it this warm elegant yet almost chaotic feel. You did not know what was going to happen, who was gong to pop up where, and most importantly who killed Edwin Drood. The entire first Act is a bit more scripted than the second, due to the fact they run out of source material to go off of. Making way f0r the best part of the show, the improvised scenes and voting. The whole idea of the show is trying to figure out who murdered Edwin Drood, and the audience members are the only ones with the answer. While the actors hold up numbered cards, they allow the audience to vote on whom they believe to be the murderer. Each actor prepared for the moments notice if they have been chosen to be the guilty crook. There is so much that goes on within this show, and each experience is a different one. Not only is that amazing, but is also just proves how out of the box theatre can be. Who would have ever thought that the idea of using an unfinished book would make way to such an amazing idea and experience? It not only keeps the actors on their toes, giving them something new to work with night after night, but it also provides audience members to see something new every time they would attend. Being the theatre lover I am, I have seen a few productions over and over when given the chance and majority of the time I would want to see the production again due to cast change. I love seeing how another actor would take on a role because it makes the show appear fresh. With The Mystery of Edwin Drood, it is always fresh every night, creating a different story each time. Sadly the show did close after its limited run in 2013 after being extended once, and releasing a cast recording which is still available. The show to this day is still the best nights of theatre I have ever had, each detail still firmly in my memory. Especially one of Stephanie J. Block speaking with me as Alice Nutting just before the overture began. This was a show that ignited that need for theatre, that need to see as much as I could and see different forms of it. This is what makes me wish the show was still running, it more than deserved it, and its cast deserving all the more praise. After leaving the show that day I couldn't help but wonder why weren’t more shows done this way, or at least why wasn’t new material being made to be more interactive with their audiences. Yes there are certain times that it shouldn’t be done, and there are times that it most certainly should. The Mystery of Edwin Drood was defiantly a must. It is no wonder that this was the best reviewed show of the 2012-13 Broadway season, and I can only hope that there will be another revival soon.